Working away at a computer all day may give the grey matter a good work out but doesn’t do much for the rest of the body. 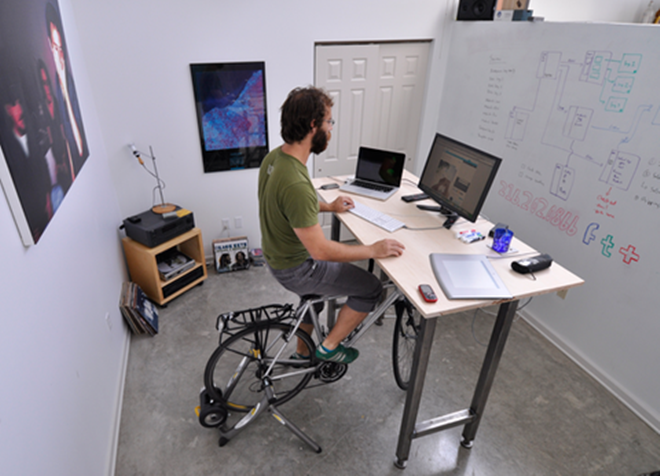 Standing desks are growing in popularity as people try to improve posture, but what about a desk that allows you to exercise on your bike while you work? This desk from Kickstand does just that allowing you to have a good work out while you put the hours in at the office. The desk can be set to stand as tall as 130 cm (51 inches) to accommodate handle bars and gears while its footers raise the bike from the ground allowing free pedalling as though you were in the park rather than the office. Unlike the novelty desks which include treadmills or bike machines, there is no inbuilt tracker or machine meaning that, with Kickstand, you can pedal away as fast or slow as you please, safe in the knowledge that you can nip away for a coffee at any time. I’m not sure how many of those I know who cycle to work would feel the need for an extra in-office session in between the ride to work and the return journey home. But if you work from home, this is a unique way of staying that little bit fitter. The $1,990 price tag might be hard to justify though. Shipping is free within the US but a delivery is likely to cost a fair amount if you’re ordering overseas.